Tonight I stopped by the new Frank Gehry designed building for the New World Symphony for the testing of the movie screen on the side of the building. Apparently two artists are creating a film that will play continually that is being made from footage and photographs of the construction of the building. The film will run very slowly but every hour on the hour the film will speed up to mark the hour. It's an interesting concept but we'll have to see how it works when it's finished and if we'll be able to see it in the light of day. 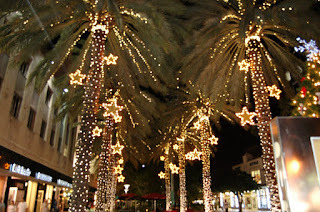 But hey, just a block away on Lincoln Road the palms are covered in Christmas lights and I'm desperately trying to get in the spirit of Christmas. I think I need a little egg nog. But I did get a new bicycle today (thank you Harvey) and for the first time in nearly a year I have brakes. I can actually stop the bike without putting my feet to the pavement. Now if that's not a Christmas miracle, I don't know what is. Happy Holidays! 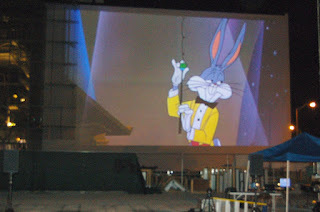 PHOTOS: Lincoln Road Christmas Lights and Bugs Bunny on the side of the New World Symphony Building designed by Frank Gehry.